"Learning is like rowing upstream; not to advance is to drop back"
I would like to share with everybody who is interested to go on learning, the amazing opportunities that we have got nows a day on the Web. There are a lot of online courses, taught by prestigious universities and schools, and the most incredible thing is that they are completely free. The available specialties are many and varied. Concretely, on the area of musical composition and production there are lots of interesting courses. Here they are some of them. These are just a sample of the many courses that are running now or later. They can spend about four or ten weeks, even though most of them last six weeks. And the workload is different in each case, but, in general, it´s reasonable, keeping the rhythm without suffering too much. Also, Ones decide when setting to study, in the night, on weekend, when possible. The fact that they are taught in English is an extra motivation to refresh all the terminology in this language. Definitely, I recommend them I´m sure that I will make more because of they really got me. Suddenly, you see yourself arguing (friendly, of course) with a person from whenever part of the world about the counterpoint exercise, teacher´s homework. 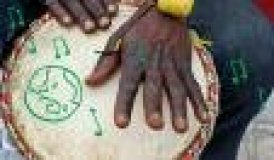 Maybe about the sound of the Mbira in several Africa´s areas. And now, stop the chat, I´m busy with homeworks.